MARION, Ind. – For a lot of programs that have an opponent with six letters in its name, the game ends in a loss to a highly-ranked and prestigious K-O-K-O-M-O. But the Wildkats have its own six-letter nemesis – C-A-R-M-E-L. For the 12th time in the last 13 meetings, the Hamilton County power got the best of the Kats. In the second semi-final of the IHSAA Class 4A Marion Regional, the defending state champion and No. 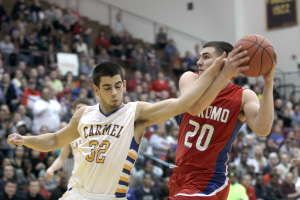 1-ranked Carmel Greyhounds topped No. 8 Kokomo 60-47, sending the Kats home for the second consecutive year. “First of all, I am really proud of our guys. What a tremendous season we have had,” said Kokomo head coach Brian McCauley. “This is a great group of young men and it was a privilege to coach them. The Wildkats earned a berth in the 4A Sweet Sixteen for a third consecutive season, but for the second straight year they met Carmel – a team that has downed the Kats in 21 of 36 meetings. In fact, against opponents that Kokomo has met at least 25 times on the hardwood, the Greyhounds are one of only three teams to have a winning record (Anderson and Muncie Central are the other two). The first half turned into a battle of runs: a 13-0 first quarter run by Carmel and a 13-2 run by Kokomo. The end result was a 22-21 Carmel lead at the half. But in the end, this game came down to two keys: foul trouble on senior LaBradford Sebree and free throw shooting. Sebree, Kokomo’s second leading scorer, picked up his third and fourth fouls in the first minute of the third quarter. He went to the bench, and Kokomo not only missed his shooting, but also his quick hands and footwork on defense. The Kats managed to stay close, trailing 31-29 at the 2:46 mark. But Carmel scored the final five of the stanza and outscored the Kats 14-8 in the third to take a seven point lead into the fourth quarter. Carmel’s James Crowley started the fourth with a 3-point play, but Wildkat junior leading scorer Tayler Persons hit back-to-back buckets to cut the lead back to six. Sebree re-entered the contest and hit a triple to cut the lead to five at the 5:13 mark. At this point, Carmel was shooting two-shots on each foul – and they made the most of it. The Hounds hit its first 12 freebies of the game, and drained 16 of 19 in the decisive fourth quarter to seal the win. Kokomo was led by the 13 point, five assist and three steals performance of Persons, a 2014 Mr. Basketball candidate. He finished his junior season with 913 career points and is on pace to become Kokomo’s third 1,300 point scorer (he would join the lofty company of Kokomo legends Goose Ligon and Jimmy Rayl). Hakim Burnett scored 11 and Sebree added 10.In his final game as a Wildkat, Kylee Beheler led the team in rebounds with five and hit the only shot he attempted. Carmel was led by the 18 points of Crowley, while Michael Volovic added 16 and Zach McRoberts 11. The Greyhounds defeated New Haven 63-57 to advance to the Class 4A Final Four. No. 1 Carmel (23-2) plays Merrillville (22-3) for the right to play in the state finals. In the Seymour Semi-State, No. 13 Jeffersonville (24-3) battles No. 7 Indianapolis Cathedral (24-5). For more Kokomo coverage, see the March 12 edition of the Sports Journal. This entry was posted in Basketball, IHSAA, Kokomo. Bookmark the permalink.